Tire chain use requirements for States requiring trucks to use chains. Winter brings many hazards to each of us every year. From December to March, nearly every part of the country can experience snow, ice, and low temperature. Extreme cold temperature often cause ice crystals, especially in shaded areas. Use caution while driving semi trucks over bridges and overpasses because of the underlying of earth does not warm them and they tend to stay slick longer. Winter snow storms sometimes go as far south as Texas, while ice storms know few boundaries. Your exposure to these adverse conditions increase the further north you travel, but the consequences of the south could be much worst due to ill prepared highway departments and drivers with lack of experience in these conditions. The key to defensive driving in such conditions are space and speed. The first defense in slick conditions is to make sure you have enough space between you and the other vehicles. Keeping enough space will allow you enough time to slow down your vehicle without sliding or causing an accident. Allow yourself enough time to stop for upcoming lights or stop signs, this will help you avoid your wheels from sliding at the last minute. The second important defensive driving technique is speed. Slow down in advance for curves, downgrades, shadows, wet spots, patches of ice or snow, and other slick areas. Speed increases the likelihood of being involved in an accident. Slowing down during harsh conditions may make your commute longer, but it is better to be late than in an accident! he following is the Laws for Tire Chain Use by Semi Trucks by State. Arizona cites Part 393 of the Federal Regs: Tire chain use of reasonable size may be used when snow, ice, or other conditions causing skidding exist. California there is no tire chain use possession law but, truckers “better not get caught without them” if the weather deteriorates. The department of Transportation reserves the right to prohibit any vehicle from entering a tire chain control area when it is determined the vehicle will experience difficulty in safely traveling through the area. On any semi-trailer only one set of tire chains is required regardless of number of axles. Tire chains on trailers may be staggered front and back. Chains are not required on tag axle. Some dual trailer configurations may be restricted from moving into a snow area when tire chains are required. Conventional tire chains and cable chains, as well as other less conventional devices such as "spikes spyder" are permitted. Trucks with cable-type chains are legal, but may be restricted at times because of conditions--which can happen commonly in the higher elevations. However, snow can fall unseasonably at higher elevations at many locations within California. Chains may be required at any time at these higher elevations, when conditions warrant. Colorado's current tire chain use law requires commercial vehicles operating on I-70 between milepost 133 (Dotsero exit) and milepost 259 (Morrison exit) from September 1st to May 31st to carry sufficient chains to be in compliance with the Colorado chain law. Colorado’s tire chain use law apply to every state highway, federal highway and interstate. The DOT says when the law is in effect, signs will be placed along roadways indicating which vehicles must chain up. Truckers can remove tire chains where bare pavement is encountered on a descending grade. Trucks must chain four wheels. Dual tire chains are an acceptable choice, but tire cables are not allowed. No tie chains are required on trailers, but Colorado will be monitoring the effectiveness of tire cables on trailer tires. Auto transporters must comply to the full extent of thee chain laws. Colorado has 2 levels of law for commercial vehicles. LEVEL 2 - This level requires chains for all commercial vehicles, including all tucks exceeding 26,001 lbs. in weight, and buses or vehicles designed to carry 16 or more passengers. Auto transports must comply to the extent possible without causing damage to hydraulic lines. Buses need to chain only two drive wheels tires to comply. Level 2 (Code 18) may be implemented at any time there is snow covering the entire traveled portion of the pavement on an ascending grade, or when road, weather, or driving conditions make this restrictions necessary to protect the safety of the traveling public and to minimize roar closures. Chains, as well wheel sanders-which carry enough sand to negotiate a hill- and pneumatically driven chains are allowed. Cables are allowed in some scenarios. An alternate traction control device known as AutoSock has been approved in Colorado. Commercial vehicles (both single and double axle) exceeding 26,000 Gross Vehicle weight or vehicles carrying 16 passengers or more will have the option of using AutoSock rather than chains. This traction control device is a fabric that slips over a vehicle's outer driving wheels, providing extra traction on snowy and icy roads. It can be installed over the tire in less time than traditional chains. To help insure that commercial vehicles have a safe location to chain up or down, CDOT has 21 tire chain use stations along the I-70 corridor, many of which have been improved over the last several years and provides more parking and a safer environment. The 11 chain stations on eastbound I-70 are located at mileposts 178, 183, 184 (shoulder), 187 (shoulder), 195, 203 (scenic area), 205, 219, 228, 241, and 251. The ten chain stations on westbound I-70 are located at mileposts 263, 260, 254, (Buffalo Overlook), 228, 223, 221, 219, 213 (brake check area) and 197 (Scenic area) and 179. In addition, CDOT has a few tire chain use stations on the I-70 east corridor at milepost 289 and 343 eastbound and milepost 358 westbound. There is also a chain station located on northbound I-25 at milepost 157 (near Monument) and southbound at milepost 172 (near Larkspur). Cables and chains are only permitted from Nov.15 through April 30. No minimum number of chains is outlined in the regulations. Has no specific tire chain use laws for trucks. State Police do, however, strongly encourage truckers to carry chains for inclement weather. Idaho officials can determine at any time, that Lookout Pass or Fourth of July Pass or Lolo Pass on Highway 12 are unsafe, either individually or as a group. If that happens, signs will alert you to chain up. If the alert is in effect, you will have to chain up a minimum of one tire on each side of the drive axle an one axle at or near the rear of each trailer. Iowa has no tire chain laws. Michigan has no tire chain use law requirements. Chains of reasonable proportion can be used for safety because of snow, ice or other conditions tending to cause a vehicle to skid. If used the chains must not come in contact with the road. Road info is also available through AAA. Their number is (800) 411-4823. Minnesota has no law on the books requiring truck tire chain use. There is no specific time frame for a tire chain use law to be in effect in Montana.. The laws go into effect when roadside signs tell all drivers to chain up. So, for a duel axle tractor, it will mean keeping four on hand for when the law goes into effect. Nevada requires you to carry tire chains for at least two wheels of a drive axle and two braking wheels of a trailer. Call (775) 793-1313 for information on all Nevada roads. If New York officials post a route as a snow emergency route, all vehicles traveling on it will be required to have snow tires and/or chains. There are no specifics in the regs as to restricted chains. North Dakota has no tire chain laws. Oregon’s tire chain law for trucks is specific and applies to all highways thought out the state for semi trucks. The law states that in addition to chaining the drive axle, tractors with one trailer must have tire chains on four tires of the primary drive axle, and if pulling two trailers, tire chains must be on four tires of the primary drive axle. When equipped with a secondary drive axle, chain two tires of the secondary drive axle. Questions about Oregon chain laws can be directed to their Ports of Entry at the following phone numbers. These numbers are staffed most hours and most days. If Pennsylvania officials post a route as a snow emergency route, all vehicles traveling on it will be required to have snow tires and/or chains on a drive axle. There are no chain laws in South Dakota. However, the state DOT has the authority to restrict travel on roads. Signs will alert you to these restrictions. Tire chains or sufficient traction devices are allowed. You don't have to wait for the signs to tell you to put your chains on. Chains are permitted if conditions tend to cause a skid are present. The only requirement involving tire chains is that every truck likely to encounter conditions requiring chains carry at least one chain. Utah has no specific law stating semi trucks must carry tire chains, but the office of the Utah Highway Patrol would like to see truckers carry chains between Nov. 1 and Mar. 31. The Washington tire chain use laws are specific and complicated. 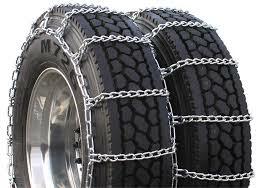 The numbers of tire chains truckers are required to carry depends on the number of drive axles. WADOT suggest giving Motor Carrier Service a call at (800) 562-6902 about their chain up requirements, trucks must carry tire chains from Nov. 1 to Apr. 1 on certain routes. Wisconsin has no tire chain use requirements, and do allow trucks to use them in slippery conditions. Wyoming’s law states that truck travel on a highway may be restricted to all wheel drive vehicle or motor vehicles equipped with tire chains or adequate snow tires when the superintendent or his authorized representative determines that travel is sufficiently hazardous due to snow, ice, or other conditions for semi trucks. The author makes no claims that these tire chain use laws are still in effect or have been changed. It is impossible to keep up with all the states when they change there laws. I will try to update this list when possible. If you are in doubt please check with each state for there specific tire chain use law.